I made a mistake and didn’t renew my yearly subscription to my Bernie’s Vintage web site. I did mange to renew my Domain name and so I still have it. I am hoping with help to get the web site up and running again. In the mean time if you are looking for vintage jewelry, evening purses or perfume bottles please send me a message. I have wonderful pieces. Many are for sell. So post a comment or a question. I am back. I am paying attention. And I love jewelry. What a wonderful time I had with my oldest daughter. She was married last weekend and she wanted to wear something from my Mom’s collection of rhinestone jewelry. We looked and sorted. We went through at least a hundred pieces before she selected a necklace and matching dangle earrings. The stones were clear with no foil backing. They were set to dangle in gold. The necklace was delicate and had so much sparkle. The earrings were not large but hung down in the same pattern and matched the dangle of the necklace. Vintage Evening Purses…Lovely and Interesting! Hello Bling Lovers! 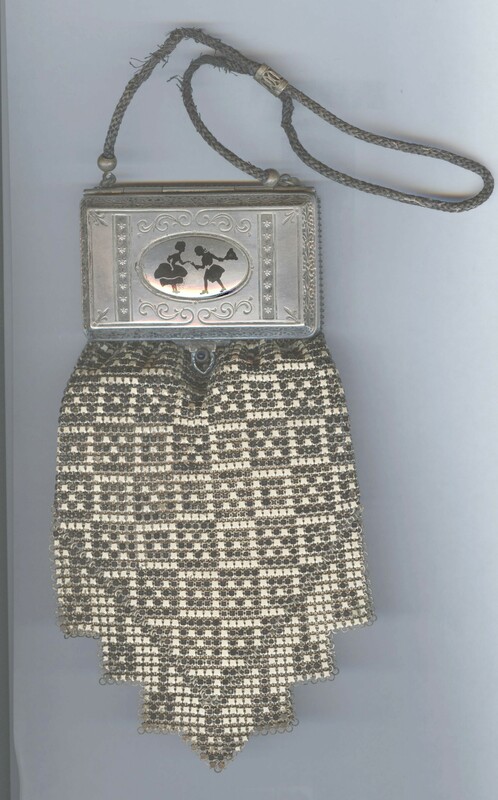 I love this old Whiting and Davis vintage evening purse. The black and white enameled design is from the Deco era. The polished silver plated compact top features a raised oval disc decorated in black enamel, depicting a colonial couple in period clothing. The inside of the compact provides a place for the lady to carry powder and rouge. There is also a small oval mirror and a fold out holder for a small comb. The compact top lifts up to reveal the interior, unlined mesh purse. The original carry black cord handle with adjustable metal slide is securely attached. I cleaned my compact with a soft cloth. I buffed the top with a silver polishing cloth. Do not use liquid silver cleaner on enameled bags. This is fun little purse to carry to dinner. Leave you cell phone at home. If you are looking for vintage purses let me know. I have hundreds. My Mom collected them for years and years. Joy Behar, these are your earrings! Amazing autumn colors. 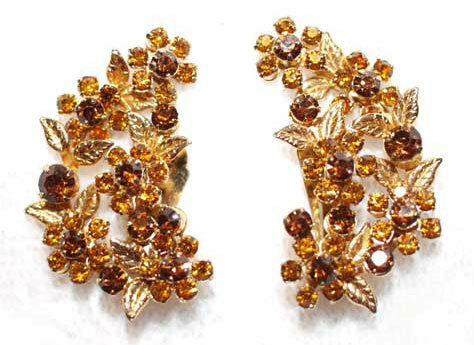 Wonderful root beer and amber-colored rhinestones set in small gold leaves. Joy Behar, these earrings are PERFECT for you! Add these sparkles to your ears. Your hair – Amber and root beer rhinestones – the perfect combination! 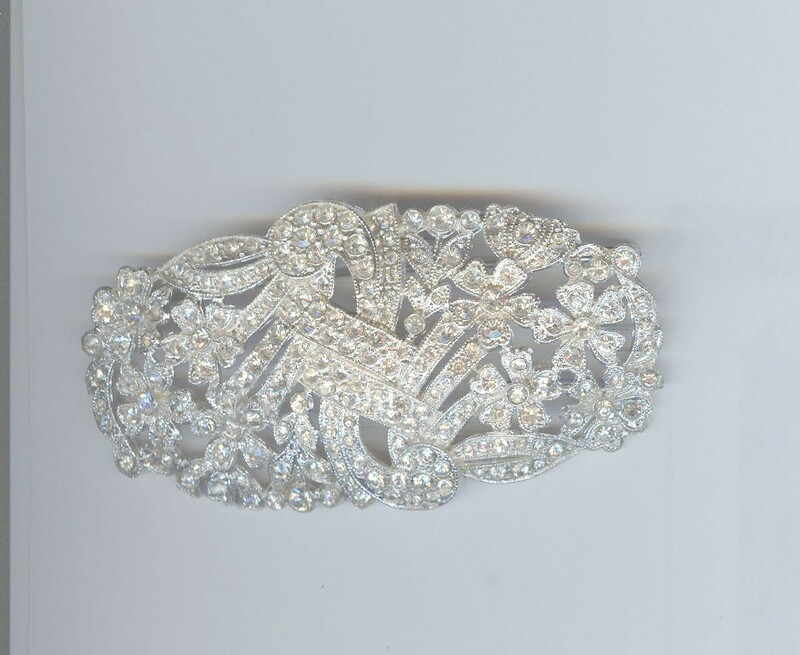 Recently members of a jewelry collecting, selling group have been talking about cleaning their rhinestone jewelry. One member used a cleaner called Awesome. He got the piece he was cleaning wet with the solution. He ended up with some of the metal finish/coating come off of the jewelry. Other members have used Jewelry Joose. (This product is difficult to find) and have gotten the jewelry wet with it. A substitute for Jewelry Joose is a solution of Ivory dish soap. The problem with any of solutions is getting the jewelry wet. If the rhinestones are foil backed or if the gold or silver is a coating or plate you may end up damaging the pieces. On the other hand dirty jewelry is not attractive and if you want to sell it you must clean it up. How? To begin, take a soft cloth and gently wipe the piece. You will be amazed at the difference this can make. Then take a Q-tip and try a little alcohol. The alcohol evaporates quickly and cuts through some types of grime. I also use a tad bit of ammonia on a Q-tip if there is greasy dirt. I admit I have “soaked” pieces in jewelry cleaner with good results. I have scrubbed the soaked pieces with a small brush. But these are pieces with rhodium metal and rhinestones that are not foil backed. I also use a blow dryer to make sure I get the piece totally dry. I leave the piece setting on a towel for a day or two and then repeat the blow drying. I do not want water trapped between the metal and the rhinestone.